Editors: Figures in this release are based on projections. Official enrollment data will be available in late August. BLOOMINGTON, Ind. -- The Bicentennial Class of 2020 at Indiana University Bloomington is setting new marks for academic achievement while demonstrating the success of the university’s long-term efforts to achieve greater diversity and keep an IU education accessible for Indiana residents. First-year students this year have the highest grade-point average and the highest average SAT/ACT scores on record. The class also will enroll over 1,000 students from underrepresented groups and increasing numbers who receive income-based financial aid from the university. Based on current projections, 7,683 first-year students will be enrolled when classes begin Monday. That is a 2.4 percent decrease from last year’s record enrollment, in keeping with goals set by the Office of Enrollment Management in consultation with campus leadership. Some 4,379 of the students are from Indiana, more Indiana resident first-year students than are enrolled at any other four-year college or university. Students come from all across the state, from most of the United States and from 35 countries. “We are delighted to welcome the Bicentennial Class of 2020,” said David B. Johnson, IU Bloomington vice provost for enrollment management. The median grade-point average for the class is 3.79, a new record; admissions officials note that GPA is a strong indicator of future college success. The average combined SAT/ACT score in math and critical reading for first-year students is estimated to be 1223, up 5 points from last year’s record of 1218. 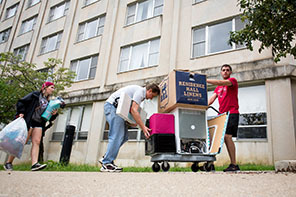 New students have been arriving on campus this week, with today the official Move-In Day for IU Bloomington residence halls. Students and families are invited to attend Freshman Induction ceremonies today, followed by several days of Welcome Week activities. For the third year in a row, IU Bloomington will enroll more than 1,000 students from underrepresented minority groups: The current projection is 1,184, just short of a campus record and a 38 percent increase over five years. Eighty-four incoming students are enrolling with Bicentennial County Scholarships, a new need-based financial aid program commemorating the 2020 bicentennial of Indiana University and targeted to 25 Indiana counties with traditionally low enrollment at Indiana University. Some 249 first-year students are projected to enroll in the Pell Promise program, a 51 percent increase over the past five years. With Pell Promise, IU provides supplemental funds to meet the full cost of tuition and mandatory fees for Indiana residents who receive federal Pell Grants. IU Bloomington projects enrollment of 809 students who are 21st Century Scholars, a state of Indiana program that helps pay for the direct costs of college for qualifying students from low-income families. That is an increase of 56 percent over five years. The number represents nearly one in five first-year students from Indiana. With its 21st Century Covenant Award program, IU provides additional need-based support to pay living expenses for qualifying 21st Century Scholars. The campus projects a record enrollment of 448 students in the Hudson and Holland Scholars Program, which serves high-achieving students who are first-generation college students or from underrepresented groups. IU Bloomington expects to enroll more than 1,000 first-year students in the Hutton Honors College for the fourth year. The Class of 2020 includes 2,735 students who are direct admits to academic program, an increase of 11 percent from last year. Also, IU Bloomington will welcome the first 32 students to its new intelligent systems engineering program. Fifty-seven percent of first-year students are Indiana residents, 34 percent are residents of other U.S. states, and 9 percent are international students.